The Manchizzle: Movies: A mighty "Wind"
Just saw Ken Loach's film The Wind That Shakes the Barley at C-house last night. What a great movie; beautifully shot, beautifully acted and nicely understated in its general tone, which allows the gut-wrenching conflict to take center stage. It makes Michael Collins look like Forrest Gump. Wind starts off looking like it's going to be a simplistic story of Good (Irish freedom fighters) vs. Evil (Black and Tans). But these boundaries dissolve into chaos, as Loach shows how fiercely the conflict over partition raged between diehard Republicans and compromise-minded Free Staters, with flaws and injustices on all sides. This film does a particularly good job of putting the Irish struggle in the context of wider European events. 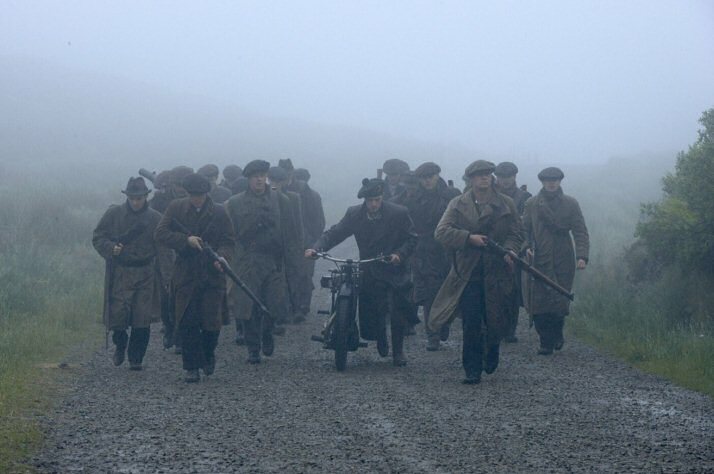 The aftereffects of the Great War in Britain (a large number of war-brutalised mercenaries to hand, a hardheaded approach to foreign policy) and the socialist movements sweeping Europe in the teens and Twenties both played significant roles in the way events played out in Ireland, and it's nice to see a movie that doesn't shrink away from showing a bigger, more complex picture of history.